Apple store in Hangzhou, China. Speaking to unidentified sources of Apple, The Information claims Apple saw significant amounts of fraud in the country relating to warranty repairs. In May 2013, the Apple Store in Shenzhen had logged more than 2,000 warranty claims per week, which was the highest of all Apple retail outlets in the world. Apple's investigation discovered the high rate was caused by a sophisticated and organized scheme, where thieves would buy or steal iPhones, remove valuable components including the processor, screen, and logic board, and replace them with fake parts or other items, including chewing gum wrappers. The thieves then returned the iPhones to the store, claiming they were broken, and received replacements that were then resold. The extracted components were then used to refurbish iPhones in other smaller Chinese cities. 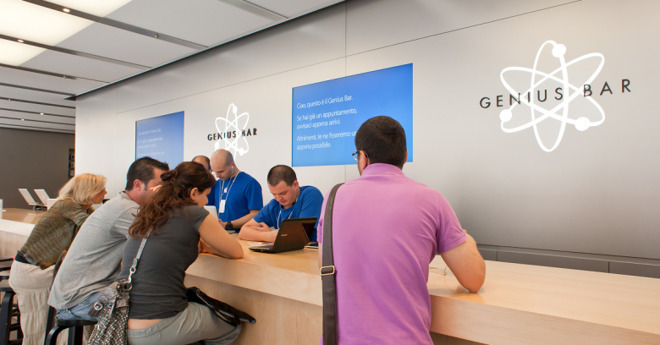 The fraudsters are claimed to have stood outside stores with "suitcases full of iPhones" that had been stripped of components, and attempt to hire people to pretend to be customers to return the devices at the Genius Bar. After the iPhones were replaced, the hired participants would hand the replacement back to the criminal and receive their pay. Shenzhen was the venue for most of the criminal schemes, in part because of the existing criminal operations in the city, as well as its proximity to Hong Kong. The Huaqiangbei electronics market is located in Shenzhen, and is thought to be the main destination for the purloined iPhone parts. Initial policy followed as with replacements in the U.S., in that store employees would swap the iPhones if there were no signs of intentional damage. At the time, it was estimated that 10 percent of warranty claims were fraudulent, based on anecdotal evidence. In 2013, an Apple data scientist started to monitor the number of iPhones that would switch to a new Apple ID following a warranty replacement, as a way to check for fraud due to legitimate replacements usually using the most recently used Apple ID. It was found that more than 60 percent of replaced iPhones in China were using a new ID. An internal fraud methodology known as Mismatch was adopted, using 300 employees fighting the problem, which had ballooned in size. While Apple had set aside $1.6 billion at the start of the 2013 fiscal year to handle global warranty claims, the amount spent ended up being $3.7 billion, with China said to be a significant contributor. The first step to reduce fraud was the addition of a reservation system that also required proof of ownership, but the system was then swarmed by hackers who managed to fill up all of the available time slots instead of allowing legitimate customers access. Diagnostic software was also created to help retail employees detect fake parts without needing to disassemble the hardware, but again this was thwarted by fraudsters simply disabling iPhones to a point where they would not turn on at all. The fraudsters also obtained customer records and serial numbers for iPhones that had already been sold in China, configuring the returning iPhones with the stolen serials, and even etching the numbers on back covers. Apple then developed another screening method which checked if serial numbers of submitted devices are already being used with Apple's online services on other iPhones. 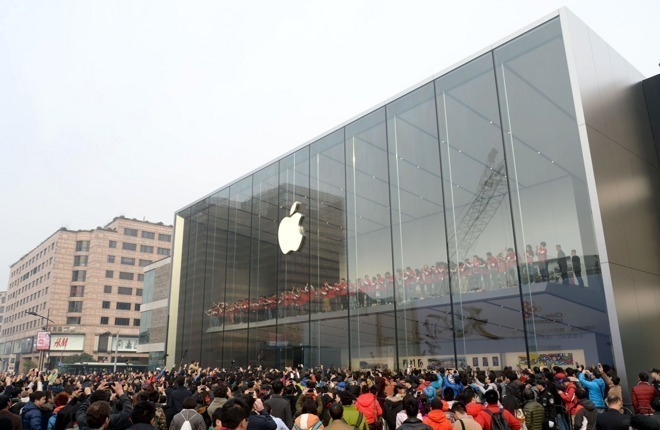 As it became harder to illegally gain replacements the criminals coerced and bribed Apple retail employees, including threatening one Chengdu manager with a cattle prod. Apple later stopped performing in-store replacements, instead requiring the devices to be sent to distribution and repair centers for inspection. A space was set up with assembly partner Pegatron to test suspicious devices, but the high numbers of devices forced the creation of four other screening centers. By 2016, fraud claims had reduced down to between 30 percent and 50 percent of all warranty claims, depending on the model. By contrast, fraud claims in the U.S. ranged between 5 percent and 10 percent of all claims. Apple has also made changes to the supply chain to ward off attempts at component theft, such as dipping batteries in a special dye visible under high frequency light, following the theft of a large batch of batteries. Processors are also coated with a waterproof sealant, again visible under certain light wavelengths, as another theft countermeasure. It is claimed that initial attempts to fend off fraud were restricted due to the secretive work culture of the company, where different departments worked separately with little co-operation. After Apple CEO Tim Cook was briefed on the extent of the problem, he was said to be on board with tackling the issue and making progress to cut fraud. Fraud is still a problem for the company, with attention shifting to other countries where Apple has a presence. Fraudsters are apparently setting up shop in the United Arab Emirates and Turkey, though at this time it is unknown how much of a problem the crime could be to the company in those markets. In China, the fraud effort appears to be working, with overall repair fraud now making up 20 percent of claims. Apple's warranty expenses also declined for the first time since the iPhone's release in 2017, dropping to $4.32 billion from $4.66 billion the previous year.